Our study shows that many small, mid-sized, corporate and multi-tenant data centers still waste much of the energy they use. One of the key issues is that many of the roughly 12 million U.S. servers operate most of the time doing little or no work but still drawing power – up to 30 percent of servers are “comatose” and no longer needed but still drawing significant amounts of power, many others are grossly underutilized. 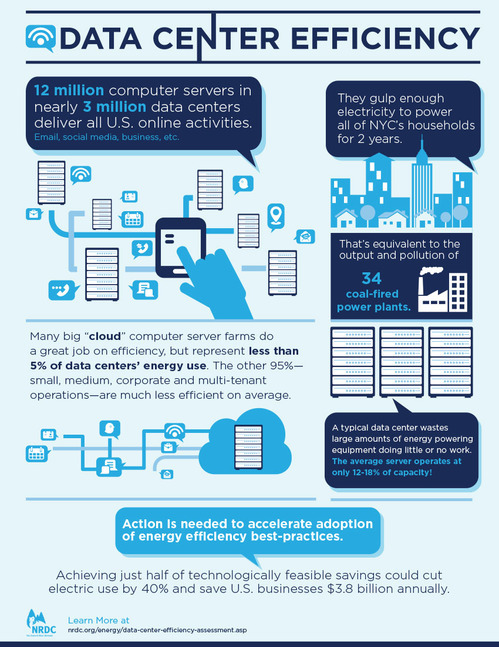 However, opportunities abound to reduce energy waste in the data center industry as a whole. The technology exists, but systemic measures are needed to remove the barriers limiting its broad adoption across the industry. Our last report Is Cloud Computing Always Greener? found these smaller data centers have generally made much less progress than their hyper-scale cloud counterparts. Our latest analysis shows energy efficiency advances are being hampered by persistent issues and market barriers such as lack of metrics and transparency, and misalignment of incentives (i.e., the person who makes the decisions affecting efficiency is rarely the same person paying the energy bills). Now is the time to rein in such energy waste, put the money saved back in Americans’ pockets and the economy, and curb the pollution generated by unnecessary power plants.